Sonny's is an oddly charming hipster shithole where the kids in skinny jeans go to kiss each other on the lips in the smoky dark light emanated from dart machines. They are one of those bars that has more character crammed into the secret-basement-employee's-only-bathroom-where-they-might-let-you-poop than most bars have in their entire repertoire. The people make the scene. Every cool kid I've ever met seems to drink here, including a Polish cowboy that I know. The food is terrible. 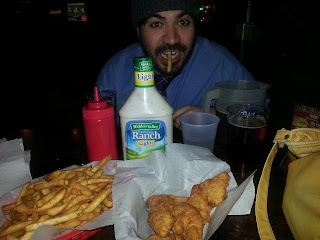 The chicken tenders were the second worst I've ever had, only second to Blush downtown. They just tasted wrong, but the problem was corrected with ranch dressing, hot sauce and beer. The french fries were acceptable, but the pizza tasted like old cardboard. I actually think it might be possible to make better pizza out of old cardboard. The crust had the composition of a used up catchers mitt and I think the cheese was made from local dog's milk. The locally sourced food movement has failed us. Despite my complaints about the food, I think this is one of the greatest bars that we've visited this year. Darts, pool tables, good company, cheap drinks and pretty girls! Pro tip, beware of the old curmudgeon who lives in the white house next door. He gets all upset when people use his ally like a frat house bathroom. THIS IS AMERICA BRO!